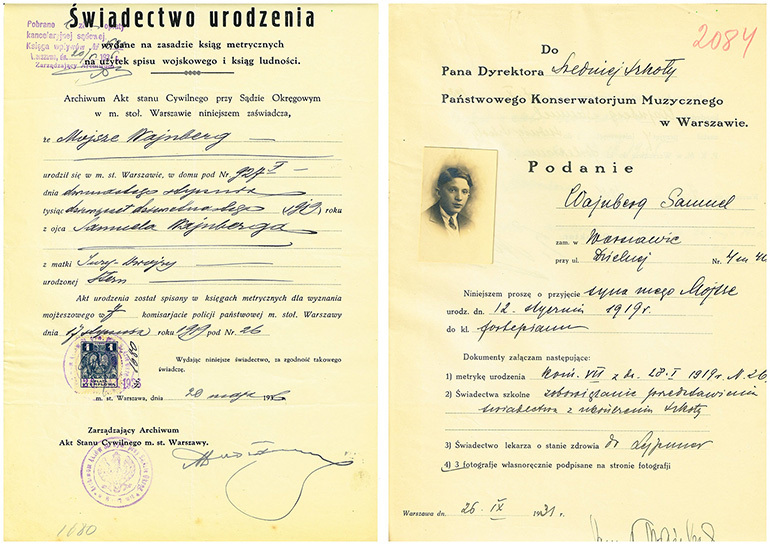 Mieczysław Wajnberg’s application for the Warsaw conservatory and the original copy of his birth certificate diversifies our knowledge of the famous composer. Professor Danuta Gwizdalanka, a musicologist who discovered these documents in the archives of the Warsaw University of Music, reports for Culture.pl. Mieczysław Wajnberg (1919-1995), was a composer and pianist who created The Passenger opera. Born in Warsaw, he left Poland forever at the age of 20, escaping from persecutions by the Nazis. He settled in the USSR. By the end of Wajnberg’s life, his works had become appreciated outside the borders of the old empire – The Passenger, a play forbidden in the USSR, had its premiere in Bregenzer in 2013 and was enthusiastically received. This birth certificate has been transcribed into the Jewish Faith Metrical Books at the 7th police station of Warsaw on the 17th of January 1919 under no. 28. The document was issued and authenticated on 20th May, 1936, in the Archive of Marital Status Acts by the Provincial Court of Warsaw, and signed by a clerk on a 1 złoty revenue stamp. The date of birth on the Moscow duplicate reads 8th December, 1919. Meanwhile, both documents preserved at the Warsaw conservatory archives state that Wajbnerg was born on 12th January, 1919. In the Moscow document, Wajnberg’s mother’s name is Sarra Kotlitzkaja; the Warsaw certificate states: Sura Dwojra (Sara Debora) Stern. Decrypting these names is Ms. Bella Szwarcman-Czarnota's great contribution. Maybe after 43 years Wajnberg was unable to recall his mother’s maiden name. The name that appears on the birth certificate and the conservatory application is Mojsze. In his adult life, Wajnberg used the name Mieczysław, and affirmed that this was the name given to him at birth. Reversion to this name was the main cause of his efforts to obtain a duplicate of the birth certificate. (Ludmila Nikitina Poczti luboj mig żizni – rabota... Stranicy biografii i tworczestwa Mjeczisława Wajnberga, "Muzykalnaja akademija" 1994 nr 5). English musicologist and Wajnberg’s biographer David Fanning has, upon my request, proved that the name Mieczysław appears on two Mazurka manuscripts. In pre-war notes on Wajnberg and in stories told by his peers (a relation of Roman Jasiński in the lead of Fredek uszczęśliwa świat / Fredek pleases the world film, for example) either “M.”, Mojsze or Moses would be evoked. The composer's signed the conservatory application as “Wajnberg”. The other spelling, “Weinberg”, appears on the covers of Syrena record label albums, and in the programmes of Qui pro quo cabaret shows. Different spelling of Polish Jews’ last names was not uncommon at the time, therefore even his son appears as “M. Weinberg” in the lead of the film Fredek uszczęśliwa świat / Fredek Pleases the World. In his adult life, the composer signed letters written in Polish as “Wajnberg”.